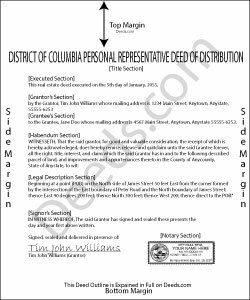 In Washington, DC, the person who oversees the administration of a decedent's estate is called a personal representative. Among a personal representative's duties is transferring the decedent's property to his or her rightful heirs. Use a personal representative's deed of distribution to convey probate real property to legatee (person to receive property under the terms of a will) or heir (person to inherit property pursuant to laws of intestacy when the decedent dies without a will). The deed conveys title without warranty, but may be customized to fit the grantor's needs. Consult a lawyer with questions about using a personal representative's deed or any other issue related to probate in Washington, DC. Celeste G. said: Very helpful!!! Thanks again. Reply from Staff: Thank you Celeste.